On this date in 1942,* a middle-aged man was hanged in the Lodz Ghetto in front of an audience of twenty thousand. His name was Max Hertz, son of Salli Hertz and Helena Hertz née Abraham. He was from Germany. 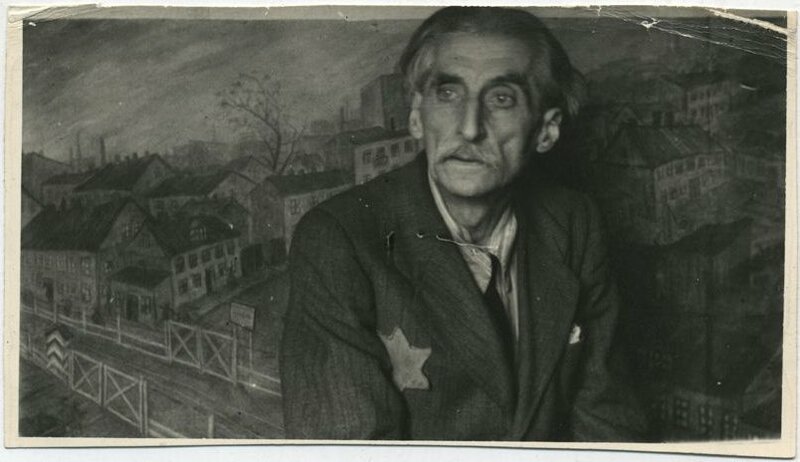 His death was recorded in heartbreaking detail by Oskar Rosenfeld, a resident of the ghetto. Rosenfeld was an Austrian-Jewish writer and translator who’d published six novels before the war. After the Anschluss in 1938, he and his wife emigrated to Prague in Czechoslovkia to escape Nazi aggression. Nazi aggression followed them, however, and the couple made plans to move to England. Mrs. Rosenfeld left in 1939 and her husband was supposed to come later, but the war started and Rosenfeld found himself trapped in Prague. Deported to the Lodz Ghetto in 1941, within a few months he secured a relatively cushy position as an archivist with the ghetto administration. He helped write the official Lodz Ghetto Chronicle, a diary of the day-to-day events of the ghetto. The diary was mostly in German, with occasional parts in Hebrew, Yiddish and English. Rosenfeld employed a simple, fairly transparent code to avoid trouble if his notebooks should come into the wrong hands. He refered to the Nazis, for example, as “Ashkenes.” When he wrote “Germans,” he meant only German Jews. The Ghetto Chairman, Mordechai Chaim Rumkowski, designated Eldest of the Jews, was often called “Praeses.” The words “Gestapo” and “Kripo” were written using the Greek alphabet. 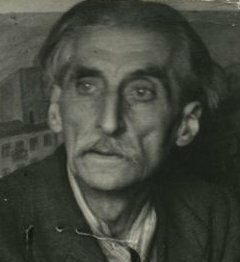 His entries described in painstaking detail the grotesque land in which he was imprisoned: the religious and cultural life of the ghetto, the residents’ attitude toward the administration, the rumors flying around about the war front, the deportations, and above all everyone’s struggle to survive from day to day. During the frigid Polish winters—unusually harsh in those years—the coal ration was pitiful, and people chopped up their own furniture for firewood. When that was gone, they turned to the streets and stole whatever they could get their hands on: fences, even sheds and outhouses were dismantled for burning. In spite of this hundreds of people froze to death. A bigger problem was food. Or rather, lack of food. the consumption of calories in normal times was 3,640 calories with 93 grams of albumen [protein] per person. The allocated ration in the fall of 1941 was 1,300 calories and 36 grams of albumen. Since the fall of 1941, the ghetto — with the minor exception of the workers in the factories — received a mere 900 calories and 25 grams of albumen per person. Not taking into account the lack of vitamins. This was no longer nutrition, this was a prescription for a slow death. People traded everything they had, literally the clothes off their backs, for a few turnips or some sausage. During times when food was particularly scarce, a diamond necklace or a good pair of shoes might fetch a single loaf of bread. And sometimes one loaf was all a person could expect to get for an entire week. When someone died — and there were deaths in nearly every family — their surviving relatives would often wait several days to report it, so they could claim the dead person’s rations. There were even reports of cannibalism, which Rosenfeld dutifully recorded. Nobody knew for sure where the deportees were going, but the ghetto residents had reason to be suspicious and fearful and most of them did everything they could to stay out of the transports. No one who was deported ever returned to the ghetto. These were supposed to be long journeys and deportees were advised to pack several days’ worth of food, but like as not, the trains would come back empty the very next day. In fact, the deportation transports usually traveled no more than forty miles outside of Lodz. Their destination was Chelmno, the Germans’ first death camp. There they used gas vans to asphyxiate their victims. These were relatively primitive and inefficient; it wasn’t until later that they came up with the idea of gas chambers instead of vehicles. The Lodz Ghetto had its own police force staffed by Jewish volunteers (who were universally despised as collaborators by the others) and a court that presided over criminal trials. The rules were harsh. Kitchen workers caught sneaking even a spoonful of soup or some half-rotted beets were subject to prosecution. A carpenter could be brought up on charges of sabotage if he took some scrap wood home to burn. Jozef Zelkowicz, another employee in the Ghetto Archives, wrote about one case where a tailor forgot he’d draped a length of of thread over his shoulder for easy access during his work. After leaving at the end of his shift, he was arrested for “stealing” the thread. Offenders usually got a short jail term of a few weeks or months. That was the least of the punishment, however: when they got out, they were often banned from working again and their families were banned from receiving welfare, essentially a death sentence. Convicted criminals and their families also had priority for deportation, however, and tended to get shipped out before they starved to death. Not this time, however. For whatever reason, the Nazis decided to make a public example of Max Hertz. At 5 p.m. on Friday, the building department had received the order for a gallows to be erected on Fischplatz by 7 a.m. the next morning. Precise specifications were given: wooden beams, heavy iron hooks, bent to a shape just this long and that wide. A man from Germany was entrusted with the job. He worked hard and long, and got it done on time. This worker was, it turned out, an intimate friend of the condemned man. The Nazis were so pleased with the craftsmanship that they placed another for a set of gallows designed to hang twelve people at once. The rumor of the true drama seems to have gained credence in the ghetto, none of the local inhabitants want to risk being forced to participate and therefore remained at home. Goaded by the sharp commands of the Jewish police, took their places, men in the front, women in the back, similar queues were streaming toward the square from other directions. It didn’t take long. Shortly before nine o’clock, Fish Square was filled with a human wall, was encircled, a horrifying silence, a few locals out of curiosity. Finally the masses begin to understand. Sense of foreboding during the march that they were to attend an execution scene (or a witch burning); in the square, many for the first time, gallows. It had been erected early in the morning by the Jewish police. Several women fainted at the sight, others fell into convulsive sobbing; several of the men managed to send some of the women back home or took them (secretly!) to nearby apartments. Those who wanted to go back later found the street blocked off; then order to seal off the surrounding area of Fish Square. Quite low on three steps, small podium, to the left across from the post office for newly settled rectangular trapdoor; above the trapdoor a vertical balcony, at the upper end a horizontal beam with a hemp cord. A cold shudder went through the onlookers… No more illusions, no dream, raw reality, for everybody knew who was Ashkenes. Several well-fed, field-gray SS officers. At the corner of the square, soldiers with mounted machine guns to keep the crowd in check. Nobody had the courage to flee. The transport leader warned of the most severe consequence for anybody who tried to leave. A few managed to get to the collective. An Ashkenes car was parked not far from the square. Word making the round: cause and candidate. Cause: Jewish star; another variant: a Communist wanted for a long time, flight only a pretext. Left wife and child to take better care of them from Germany (name: Herz [sic], Cologne). The wife is said to be among the onlookers, unaware of what’s happening. Men quite numb. Some of the women somewhat worried. The Ashkenes men are in a good mood, well fed, smoking, looking cheerfully at the crowd. Not a word was heard. Silence. The candidate shivered in the cold. The field-grays in furs. His overcoat was taken from him. He folded his hands. Saw the entire scene, the crowd. Implacable. Mounted the steps to the podium. There was met by two Jewish policemen and a third man who busied himself callously with the cord. A hanging (not necessarily this one) in Lodz Ghetto. Many expected instead of this plea some kind of demonstration as a legacy from the crowd, some inspiring motto. But nothing of the sort. He was no hero in our sense. Now eyes averted from the gallows, dull thumping was heard of heavy material and wood, a few seconds for the convulsing body, dangling. The crowd was even able to look at it for some time—seconds (counting to thirteen). The corpse softly in the wind. Rigid features, rigid limbs. The body remained hanging the entire Shabbat. The Jews avoided the place. 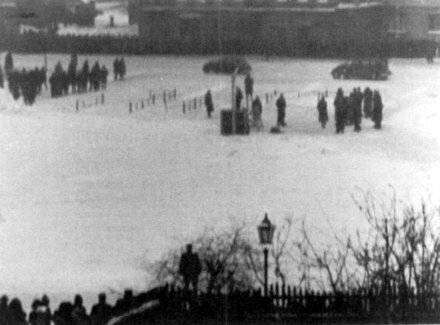 The Lodz Ghetto Chronicle includes an entry on this execution, noting it took place in a large square at Bazarna and Lutomierska Streets. According to the chronicle, Max Hertz had escaped the ghetto and spent several days in Lodz proper. He was arrested at the train station when he tried to buy a ticket to Cologne. This was about three weeks before his execution. The spectacle of Max Hertz’s death had indeed left an unforgettable impression on its audience, just as the Nazis intended. We are facing either apocalypse or redemption… There are plenty of skeptics, nigglers, who don’t want to believe it and still have doubts about that which they have been long and waiting for years… After so much suffering and terror, after so many disappointments, it is hardly surprising that they are not willing to give themselves over to anticipatory rejoicing. The heart is marred with scars, the brain encrusted with dashed hopes. It turned out to be apocalypse: in August, before the Red Army liberated Lodz, the ghetto was liquidated and almost all of its inhabitants sent to Auschwitz. Like most of the others, Rosenfeld was gassed on arrival. He was sixty years old. But his notebooks survived him, and ultimately ended up in the custody of Yad Vashem. His diary was published in English for the first time in 2003, under the title In the Beginning was the Ghetto: Notebooks From Lodz. * Rosenfeld places the date of the execution on Friday, February 20. All other sources, including the Lodz Ghetto Chronicle and Max Hertz’s Yad Vashem page of testimony, place it as Saturday, February 21, but I’m sure Rosenfeld is right. The execution seems to have taken place at the beginning of the Jewish Sabbath. The Sabbath is on Saturday, but to religious Jews it actually starts after sunset on Friday; Rosenfeld writes that the body “remained hanging the entire Sabbath” which implies it hung for some time. If it hung “for the entire Sabbath” starting Saturday night, that would have been for less than two hours.